Are you happy? If not, know that only by developing a habit of gratitude can you lead a happier life. Gratitude is beneficial to your health, happiness, life satisfaction, and your relationships with others. This is because gratitude helps your brain focus on the positive aspects of life. To learn even more of the benefits of gratitude, and how you can incorporate gratitude into your life, read on. Only 33 percent of people in the United States are happy, according to the 2017 Harris Poll Survey of American Happiness. While this number may seem low, believe it or not, overall happiness is up two points from the previous year. The Harris Polls suggest that Americans have never been particularly happy. In fact, happiness levels peaked at 35 percent in the happiness survey’s first year. 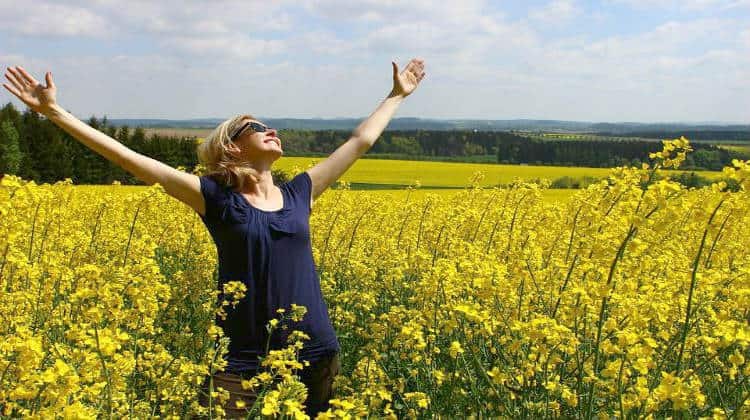 So, what exactly is gratitude and how can it lead to a happier life? Harvard Medical School defines gratitude as, “a thankful appreciation for what an individual receives, whether tangible or intangible.” Below, we’ll go into even more depth. Many consider Dr. Robert Emmons to be the world’s leading expert on gratitude. This professor of psychology at the University of California, Davis, and his colleagues published a study in which they looked at the benefits of writing gratitude diaries. The team of scientists enrolled nearly 200 college undergraduates into the study and assigned them 10 weekly diary entries. The researchers then divided the participants into three groups: the gratitude group wrote about their blessings; another group wrote about hassles and annoyances; a third group wrote about neutral events. The weekly diary form also included ratings of mood, physical symptoms, time spent exercising, and other questions. To rate mood, participants could select from 30 terms, such as interested, sad, stressed, joyful, nervous and grateful. The participants would then rate the extent to which they experienced the feeling during the previous week on a scale of 1 to 5, where 1 indicates that they barely felt the emotion at all and 5 means they felt the emotion deeply. At the end of the 10-week study, participants in the gratitude group said they felt more positive about their lives. Additionally, they were more optimistic about the week ahead, spent more time exercising, and experienced fewer negative physical symptoms. Following these results, the scientists increased the frequency of diary entries to once a day for two weeks. The researchers also asked those in the neutral life events group to write about ways that the participants were better off than others. Not surprisingly, the people in the gratitude group enjoyed a more positive mood during the two-week period than the other groups in the study. Those in the gratitude group were also more likely to report engaging in acts of service, such as offering emotional support or other assistance to another. The researchers then decided to perform a longer study. They selected participants who had health problems to determine the effects of long-term gratitude on health. They asked 65 adults with neuromuscular problems to either write gratitude diaries for 21 days or fill out assessments of mood, well-being, and health. The scientists found that the gratitude group enjoyed more positive life views and less negative moods each day. Those in the gratitude group also reported better sleep. How does Gratitude Lead to a Happier Life? Gratitude leads to a happier life by helping the brain focus on the positive aspects of life, rather than dwelling on the negative. The human brain has a negative bias, which means it pays more attention to negative news than to positive events. This negative bias helps the brain remain alert to potentially dangerous situations. In contrast, feeling gratitude for what we have in life, and expressing our gratitude to others, turns our attention toward the positive aspects of life. This positive attitude compensates for the brain’s negative bias that focuses on worries, threats, and the other negative aspects of everyday life. Because it refocuses the brain away from the negative and toward the positive, gratitude creates positive emotions that can loosen the grip of anxiety and other negative emotions associated with unhappiness. Focusing on individual thoughts of gratitude can create entire cycles of positive thoughts and behaviors that can, in turn, foster lifelong good health and happiness. When combined with mindfulness, gratitude helps us focus on the present and appreciate what we have now, rather than focusing on the things we do not have. How do you think gratitude leads you to a happier life? Share your insights with us in the comment below! Up Next: What Is Spirituality and What Can It Mean for You?